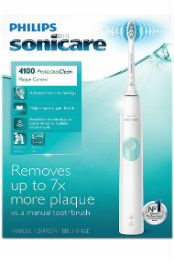 The Philips Sonicare ProtectiveClean 4100 is an easy to use electric toothbrush. It is powered by a Lithium-Ion cell that is irremovable and will last up to 14 days (brushing twice per day). It is not the cheapest option out there, but it does come with some useful features. Check out our review below. Why Philips Sonicare ProtectiveClean 4100? With up to 62,000 movements per minute, the ProtectiveClean 4100 removes 7x more plaque than manual toothbrushes making you less prone to cavities. The inbuilt pressure sensor lets you know when you’re brushing too hard. The quad pacer and timer make sure you give equal attention to all parts of your mouth while brushing for the recommended two minutes. The brush consists of 2 major parts, the brush head (detachable) and the handle. The handle has a slim ergonomic design which makes it easy to hold. The brush head incorporates the slim and classy design native to the Sonicare brushes. Its easy click on feature makes it easy to remove and replace when necessary. Instead of the common glossy white finish, the plastic finish has a matte feel which gives it a better grip. Despite its minimal gripping points, the brush can still be held securely. The grip may be enhanced by a few strategically placed pieces of rubber, but this may detract from the neat and classy design. The ProtectiveClean 4100 electric toothbrush is available in two different color combinations – White and Black, or Mint and White. Both color options come equipped with the same features, so you do not need to worry about that. ProtectiveClean 4100 has a feature known as ‘BrushSync.’ Despite its vague name, what it does is quite clever, it lets you know when your brush head needs replacement. When you fit the brush head to the handle, it detects the microchip in the brush head and flashes the warning light 3 times. This confirms that the head has been detected by the handle and that the electronics in the handle will monitor it. The handle monitors its usage time, and as soon as it detects that the brush head has been in use for 3 months, the ‘BrushSync’ LED located on the handle will display an Orange/Amber color to inform you that the brush head is due for replacement. Another feature of the toothbrush, EasyStart, is a system which gradually increases the power over your first 14 brushing sessions to help you get accustomed to brushing with the product. This is a simple, yet innovative touch which shows an extra level of care and attention for first-time users of electric toothbrushes. If you aren’t used to the power of an electric toothbrush, the 31,000 brush strokes (62,000 movements each minute) can seem too intense at first. That’s where EasyStart has you covered. This feature can be turned off for users who don’t need it. ProtectiveClean 4100 comes with a built-in pressure sensor which alerts you by vibrating when you apply too much pressure. The sound and brushing sensation also changes. To stop/avoid the pressure sensor from vibrating, simply reduce the applied pressure on the teeth. In most cases, people brush at home where they’re close to a power outlet, so they don’t need to bother about how long its battery lasts since it’s easy to recharge. However, if you’re among the few who travel regularly and do not like carrying heavy luggage, you may want to leave your charger at home. The Sonicare ProtectiveClean 4100 offers a 14-day battery life which is about 56 minutes usage time if you brush twice per day for 2 minutes at a time. This is great, though I was able to use it for 4 weeks while testing, 2 times what Sonicare claimed. I cannot guarantee you’ll get the same performance, but it’s safe to say the absolute minimum is 2 weeks. It uses a Lithium-Ion cell which is sealed in the handle and cannot be removed. It is more reliable and efficient than the Nickel Metal Hydride cells which are being used in several other toothbrushes. A little but significant feature that enables the longer usage time of the brush is the automatic power-off. After a cleaning session, the brush will turn off by itself to save power. You can detect when the power is low through its battery LED indicator. When this happens, simply pop it on the charging stand for about 24 hours to be fully charged. Charging the handle fully can take up to 24 hours. Wired in the charging stand is a US power adapter, which supports 100-240v. This implies that you can use the charging stand when you travel to another country. You’ll require only a plug adapter, not a voltage adapter. There is a charging/battery icon located on the front of the brush handle, towards the bottom area. It tells the amount of power left in the Lithium battery by the color and the way it flashes. Solid Green LED implies a full battery. Flashing Green LED implies a medium battery. Flashing Amber LED & 3 beeps imply a low battery. Flashing Amber LED & 5 beeps imply there’s no more brushing session left, and the toothbrush needs to be charged. The Philips Sonicare ProtectiveClean 4100 electric toothbrush is practically faultless and is a good choice for new and regular users of electric toothbrushes. It provides excellent cleans. After each use, my mouth always feels refreshed. If what you seek is a good electric toothbrush which has a long-lasting battery life, is reliable, delivers a perfectly clean and isn’t bogged down by irrelevant features, this product could suffice.